Bonus Material: Are African and Asian Writers Compromised by Writing in English? 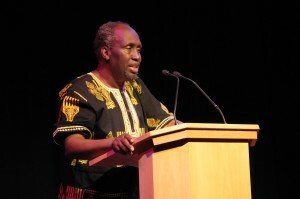 In our profile of the international literary magazine Wasafiri, Kenyan novelist Ngũgĩ wa Thiong’o suggests that Africans and Asian writers who want a global audience need to be published in English. It appears to be an intractable problem: Write in English and make the compromise or write in your indigenous language for a smaller, and perhaps even more appreciative, audience. Is Ngũgĩ wa Thiong’o right? And what can be done? Tells us what you think in the comments below or let us know via Twitter using the hashtag #ppbonus.